It is politically incorrect to see any good in Donald Trump. Even many of my Republican friends (and all who are Democratic) are dismayed at the thought of a President Trump, who – they assume – will inevitably lead the US to catastrophe. After 8 years of a lack-lustre and indecisive, risk-averse Barack Obama who promised much only to deceive, Hillary Clinton offers “more of the same”. She is as “establishment” as it is possible to be. She represents the safe choice. There is no chance of any kind of greatness, only of a slight improvement or a gentle decline. She removes the possibility of a “high gain” scenario. But I see two possible outcomes with Donald Trump. The first is that he will be the unmitigated disaster that the media and the politically correct expect. In this scenario, the US will become a harder, more bigoted country, less tolerant of minorities and less compassionate. It will become divisive in domestic affairs and inept and dangerous in its foreign policy. It will become a sin to remain poor. But there is a second scenario and I think there is nothing in-between. The second scenario is that US domestic and foreign policy will become entirely “trade” oriented. International friendships and alliances will have to have a cost-benefit analysis. Public spending and government jobs will be drastically down-sized. Bureaucrats will be subject to performance indicators. It will not be a sin to be rich. The ideological shift will be to “people as they deserve” rather than to “people as they desire”. 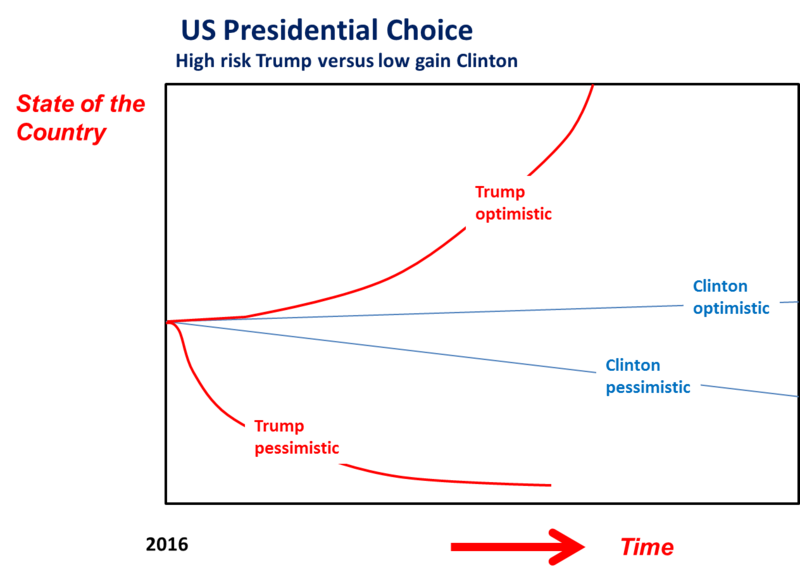 In November, the US electorate are going to be faced with the safe choice of Hillary Clinton with no great upside or any catastrophe, or a highly risky choice of Donald Trump who could lead to disaster or could conceivably lift the country to new highs. It is high risk with Trump versus low gain with Clinton. I generally tend to associate socialistic Europe with low-risk (low gain) policies and the free-wheeling capitalism of the US with high risk (high gain) policies. Not unlike the distinction between Clinton and Trump. I suspect that Trump’s chances against Clinton are being written off a little too soon. His chances are certainly better than the 5000:1 odds of Leicester City winning the English Premier League. Every pundit has so far grossly under-estimated the strength of the anti-establishment wave. That could be a tsunami for Trump in November. If Leicester City could win the Premier League, Donald Trump could be elected President of the US.